Frank Adler (Chris Evans) is a single man raising a child prodigy – his spirited young niece Mary (Mckenna Grace) – in a coastal town in Florida. Frank’s plans for a normal school life for Mary are foiled when the seven-year-old’s mathematical abilities come to the attention of Frank’s formidable mother Evelyn (Lindsay Duncan) whose plans for her granddaughter threaten to separate Frank and Mary. When I first caught the movie trailer last year on Facebook, I was intrigued and anticipating the movie. The movie has one of those trailers which show the whole plot, yet it managed to draw my attention and make me look forward to the film. 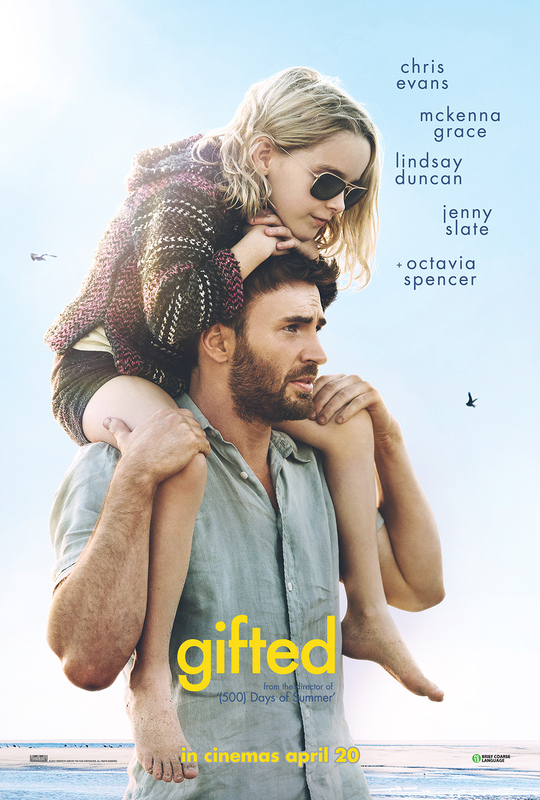 GIFTED is a somewhat-predictable movie without much plot twists, but it won me over with the cast’s amazing performance, the intricate relationships as well as its heartfelt storyline. I’m a big fan of Captain America, not Chris Evans. I have to admit that I didn’t think he didn’t think he could pull off this movie without making me think about his Steve Rogers persona. But this movie provide a refreshing view of Chris Evans which somehow reminds me of Zac Efron in Charlie St Cloud. It was exceptional how he gave the character a multi-dimensional emotional depth he deserves. Frank, an ex-philosopher professor who gave up his career and his life to raise his niece, the guilt, resentment, fear, love for his niece, coupled with the complexity in his past and how he try to evade being emotionally close to anyone, Chris Evans did it with incredible finesse. The chemistry between Frank (Chris Evans) and Mary (Mckenna Grace) was enviably natural. It almost felt as if Mckenna is Chris Evans’ real niece or relative. Those esoteric exchanges, the sassy, battle-of-wits dialogues, the moments when Mary clambers all over her uncle in the gorgeous sunset, sits on his chest like he’s not Chris Evans, and hit him all over when she bawls her eyes out, it was impossible not to be moved by her authentic performance. The addition of villainous Devil-Wears-Prada-ish grandmother Evelyn Adler (Lindsay Duncan) shifted the otherwise comfortable dynamic of the small cast. Don’t get me wrong, the initial portrayal was nicely changed when through her fierce commitment and belief, something I realised I can’t fault her for. It also addresses the fundamental question of this film – should a gifted child be among the smart, separated from the general crowd, and develop their skills to the maximum, or should they be with kids of their own age? I have to confess that I belonged to Team Evelyn before this movie, if you got a talent, you gotta tap on it. But this film remind me that a kid is a kid. Being kind, sociable and learning how to live in this world is much more important. Overall, aside from the few motion-sickness-inducing scenes, GIFTED is a story with stunning cinematography. Every supporting character has more than one purpose in the story. They all have a sufficient stake without trying to outshine or overtake the main leads. Octavia Spencer as humorous neighbour Roberta was not just a mother character to Mary and sister character to Frank, her lack of say in the custody touched on the topic of how family doesn’t just mean blood relatives. In untraditional family unit, Roberta is as much of a family member to Mary as Evelyn is. Bonnie Stevenson (Jenny Slate), Mary’s public school teacher, was not just a school teacher who discovered Mary’s exceptional mathematical skills and Frank’s love interest, of which some people might find unnecessary. She provided the much-needed companionship Frank needed. She guided Frank and the quiet chemistry between themwas thoughtful and well-executed. This sincere piece of work, along with the excellent rapport within the cast, is undeniably a gift for all of us. Gifted (2016), is Marc Webb’s first original film since 500 Days of Summer (2009). Chris Evans revealed that the main reason why he chose to act in GIFTED was because of director Marc Webb. After filming head ended, Chris Evans and Jenny Slate began a relationship and broke up almost a year later. Tom Flynn wrote this original script, inspired by his sister and his 2 nieces, one of whom really did punch out a bully on the school bus just like Mary Adler. He felt that he wrote the script for the story and characters instead of the market. Coincidentally, Webb himself, like Flynn, came from a family in love with mathematics, he had an immediate physical and emotional connection to the material. Mckenna Grace memorize the equations by making it into a song, singing along with sophisticated and very real equations with pi and alphas and absolute values. Oscar winner Octavia Spencer showed up on the set most every day even when she’s not working. Mathematician Jordan Ellenberg, author of “How Not to Be Wrong: The Power of Mathematical Thinking” is the Mathematician Technical Advisor of the film and cameoed in the movie as a Professor. His mother’s advice was also seeked by Lindsay Duncan – on the joy and challenges of raising a gifted child. Check out Gifted 2017 Movie (天才的礼物) Facebook Page! Gifted Movie (天才的礼物) is out in cinemas on 20th April 2017. *Disclosure: Invitation from Twentieth Century Fox. No monetary compensation was received for the movie review. I remember reading reviews about this movie when it came out in the US. I liked the cast of characters and the storyline. I will watch it soon. I have never been a team Evelyn. I have a child diagnosed gifted and we try our best to give him a happy childhood. But the fact is, he has certain needs – emotional, psychological, (and yes, medical in a way) needs that are different from other kids that need to be met; and that we’re starting to realize lately. It’s very challenging. I think I’m going to cry when I see this movie. Funny how you mention Charlie St Cloud. I thought Zac Efron did an awfully good job there. I’m not a Capt America fan, but I had better hopes for Chris Evans’ acting. looking forward to seeing this one with tissues everywhere. The most awaited movie I must say. This is another interesting movie to watch. Thank you so much for sharing this one. You never fail to provide me a good movie to add on my movie list to watch. Oh, this one I missed attending…There was an invite but was in office so couldn’t. Looks like really nice movie. The kid has acted so well. That’s so beautiful! Going by the pictures, I thought its a father-daugher movie! The story line is so touching! The balance is somewhere in the middle I guess – to tap their talent, yet let them be a kid! Gifted seems like a movie I would really be interested to watch. I might watch this very soon. I haven`t seen a movie that`s not animated from the west for quite a long time. It looks like a really good movie. It’s also nice that it stars Chris Evans. I’ll check it out. It looks beautiful with an amazing story line. Actually I loved the title “Gifted” and hope to catch it soon. I always like how Chris acts in films. I think he’s flexible when it comes to the roles that are assigned to him. Just recently, I’ve watched Before We Go. It’s a film where he starred and incredibly, it was also directed by Him. The question regarding the kid intrigues me. I must watch this too. thanks. I remember Octavia Spencer in the film “Hidden Figures”. She’s a Mathematician in the said film. I guess, she likes doing a role if the film has a Mathematician. Or just a coincidence. I’ll just watch this film. It looks promising.